The Old Pulteney distillery is one the most northern on the Scottish mainland, located in Wick on the windy coast of the North Sea. Old Pulteney’s location by the windy North Sea is important and it explains why Old Pulteney describes itself as the “genuine maritime malt”. While whisky ages in oak casks those casks “breathe” because oak is porous. Due to this “breathing” whisky is thought to soak up the ambient aromas and flavours that surround it. This means that, at least in theory, Old Pulteney whisky should soak up some of the maritime character of the North Sea while it ages by the coast. 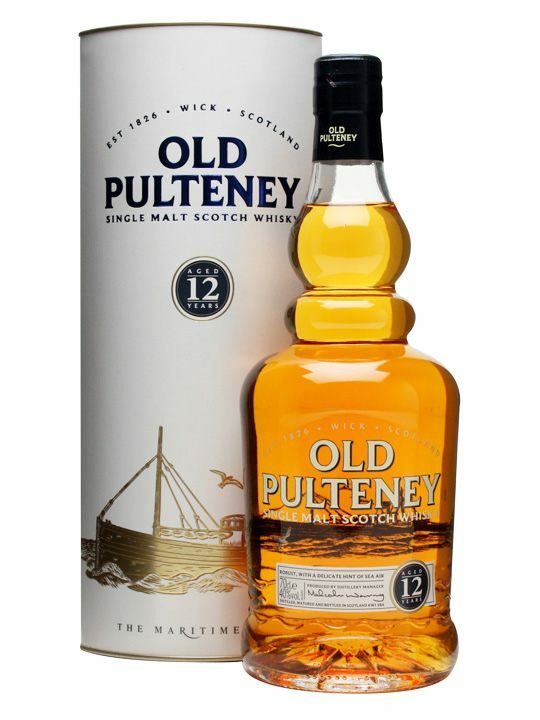 In relation to the Old Pulteney 12 year old, the whisky has spent 12 years ageing in ex-bourbon casks and judging by its taste and finish the winds of the North Sea were definitely whirling around those casks over the 12 years because this whisky has plenty of maritime salt, especially on the finish. The bouquet opens up with cut oranges, mandarin peel, raisins, hints of vanilla, honey, dried oats and crushed mint/parsley. On the palate the maritime character develops with cereal notes, vanilla, nuts, raisin and heavy bourbon wood influence with hints of spice. The finish offers a lingering salinity, similar to saline solution, with alkaline and the haze of spicy oak. Overall, the Old Pulteney 12 year old is a typical ex-bourbon matured Highland malt with a distinctive salty twist that becomes increasingly noticeable on the finish. This twist makes it a refreshing change to most other malts, and ideal for those who want a bit of maritime character without the peat! This entry was posted in Highlands and tagged Old Pulteney. Bookmark the permalink.